Photograph courtesy Tony Sayer When Derby had a Locomotive Works the view from Platform 6 provided ample evidence of this, with many Works buildings and other items creating an interesting backdrop for any trains or light engines that used the goods lines. In this view 7516 appears to be gaining access to the lines leading to the refuelling shed on August 13th 1970. Although steam has been gone for two years the 'D' prefix is still carried by the locomotive and the telltale water stains mar the work worn two tone green livery. The almost fifteen year eleven month career of D7516/25166 was spent allocated to London Midland & Western Region depots. December 1964 to Cricklewood (14B). September 1965 London Midland (Midland) Lines. May 1968 to London Midland (Midland) Lines. June 1966 to Nottingham Division (D16). January 1972 to Ebbw Junction (86B, later EJ). 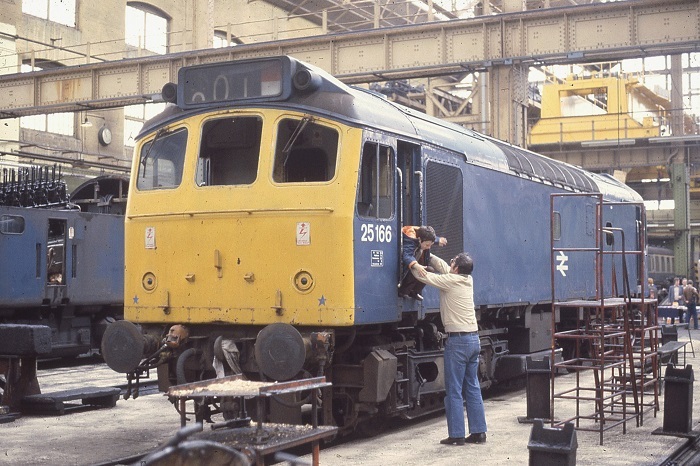 26166 was the 63rd Class 25 withdrawn, one of seventeen retired during November 1980, including shedmates 25159 & 25163. 25166 was moved to Swindon on March 3rd 1981 and was broken up by the first week of July 1981. 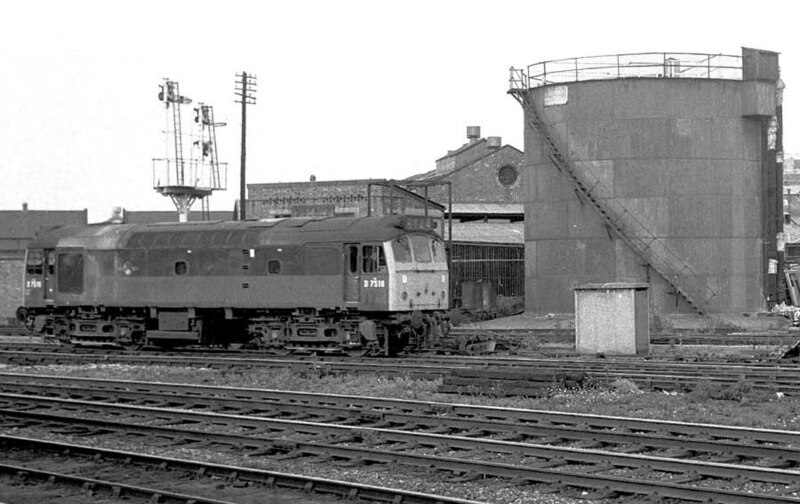 Noted ex-works May 1976, presumed at Derby Works during spring of 1976. Noted Derby Works late July, August & September 1979 for N1 repairs. 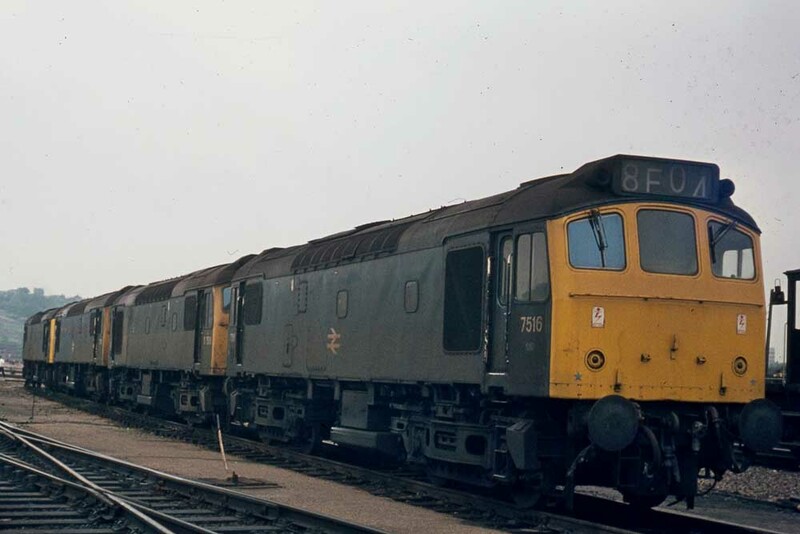 After withdrawal 25166 remained at Crewe until the March 3rd 1981 when arrangement was made for the movement of 25070, 25166, 25263/293 from Crewe Diesel Depot to Swindon Works. 25166 was broken up at Swindon during July 1981. The Swindon Works Open Day on June 6th 1981 provided a great variety for visitors, with many locomotives present for scrapping. Included in the category was 25166 which in this view looks relatively intact. It would not take long however for the workers to begin the first steps in dismantling the locomotive. The recorded passenger workings for D7516/25166 are few. Possibly its first recorded working took place on June 18th working the 08.36 Nottingham - Llandudno Town and the return Llandudno Town - Nottingham with D5292. On July 5th D7516 worked the 07.35 Nottingham - Llandudno Town and the 13.52 return. On July 20th the 09.00 Sheffield - St. Pancras was worked to Nottingham by 7516 & 7507. Photograph courtesy Peter Lovell 7516, 7518, 7510 & 7521 at Ebbw Junction on May 27th 1973. On January 5th was noted on an unidentified two coach passenger working between Worcester Shrub Hill & Birmingham New Street. 25166 was noted working freights in the Margam area on March 11th & 12th. 25166 handled the Nuneaton - Hinckley trip working on July 29th. On December 10th 25166 was noted at Barrow-in-Furness with a train of oil tanks. 25166 & 25168 were noted passing Etruria station on March 24th as light engines en-route to Grange Junction sidings? 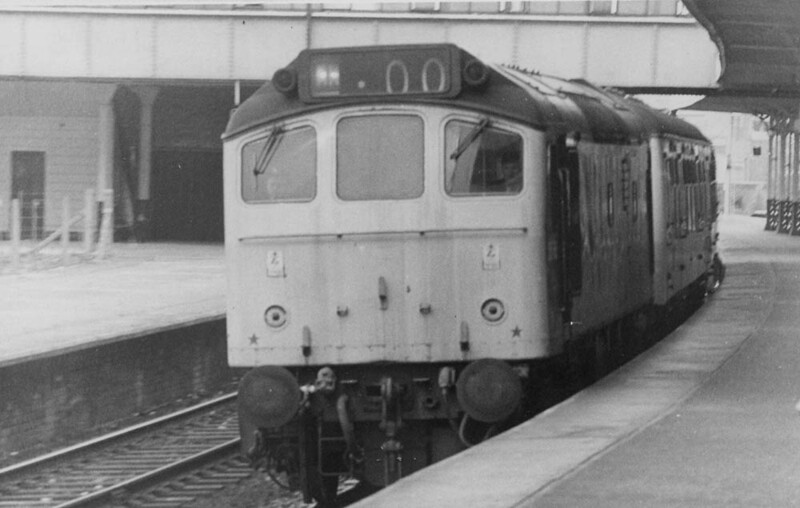 The 15.07 Plymouth - Manchester Piccadilly was worked between Gloucester & Birmingham New Street by 25166 on May 31st 1978. On July 18th 25166 worked the 19.30 Exeter St. Davids - Paignton. On November 21st 25166 hauled Eastern Region Class 313 No. 313003 from Hall Road to Falkland Junction via Blackburn and the Settle & Carlisle. The Class 313 had been sent to Merseyside to be used on the Royal visit should the first of the new Class 507 units from York not be received in time. The Class 25 quickly returned to Carlisle. It is not often that one gets to show the activity of a locomotive over a short period of time, but the views below were believed to have been taken by the photographer whilst on holiday in North Wales. It is presumed that during this visit 25166 remained close to Llandudno Junction shed for a week of duties. Photograph courtesy A Forster On May 31st 1979 25166 was noted heading east through Llandudno Junction at 11.43am hauling a failed diesel multiple unit. On June 2nd at 11.51am was noted 25166 running light engine at Deganwy towards Llandudno. 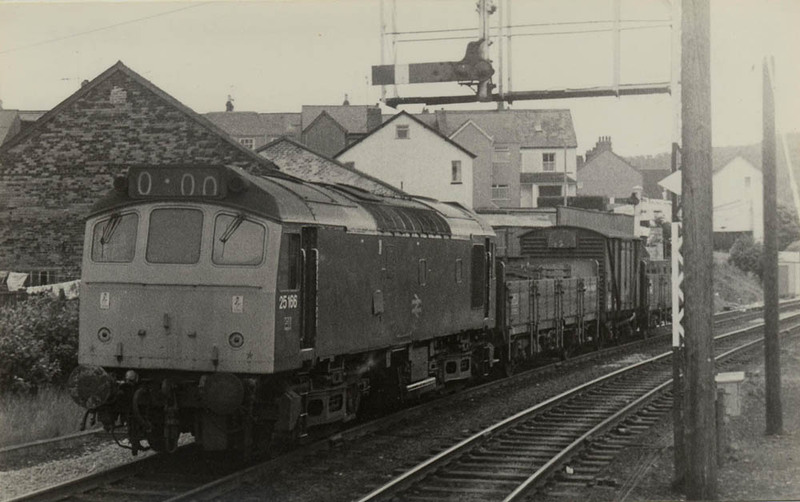 Photograph courtesy A Forster On June 5th 1979 at 11.30am 25166 was noted arriving at Llandudno Junction with a short freight. 25166 & 25132 were noted eastbound at Bangor with a trainload of old ballast on July 1st. On May 19th 25166 was noted at Chester dragging GWR 0-6-0 3205 and LMS 4-6-0 43106 en route from the Severn Valley Railway to Bold Colliery near Wigan for the Rainhill Trials. On July 20th a Shrewsbury - Scarborough day excursion was worked roundtrip by 25166 & 25169. 25166 was withdrawn on November 2nd 1980. Page added November 23rd 2009.